When you set out to build something, the ?nished product is only as strong as its foundation. So when Core Health & Fitness brought together ?tness brands from all corners of the industry, we settled for nothing but the best. Star Trac. StairMaster. Nautilus. Schwinn. Four iconic brands that pioneered entire categories, and whose machines are still the ones members ask for by name. Today, we're committed to continuing the tradition that started decades ago — and that's greatness you can feel good about building on. 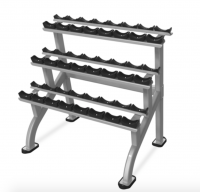 Molded urethane cradles for quite, safe dumbbell placement. Rubber feet for floor protection.